At first, people told them they were crazy. They were crazy for wanting to open a brewery in downtown Muskegon. No one goes there, they were told. The voices were loud, but Pigeon Hill Brewing Company’s owners Michael Brower, Joel Kamp and Chad Doane didn’t listen to them. They knew there was nowhere else they wanted their brewery to call home. 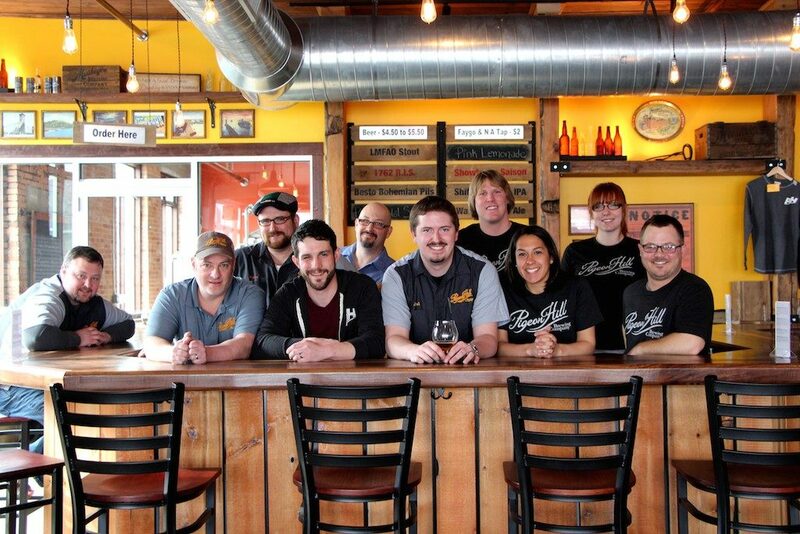 “When we started building up the taproom, people would say we were crazy for coming downtown, and I said, ‘No, we believe in this,'” said Brower, who grew up in Muskegon and now lives downtown. Of course, that wasn’t to say there weren’t moments when they were scared. With the constant hum of construction happening these days, it can be easy to forget the downtown of five years ago. Now, exactly five years after Pigeon Hill opened on March 21, 2014, we know: they came. And they keep coming. As the business prepares to celebrate its fifth anniversary with a two-day party this Friday, March 22 and Saturday, March 23, Pigeon Hill is in a place where no one is calling them crazy. 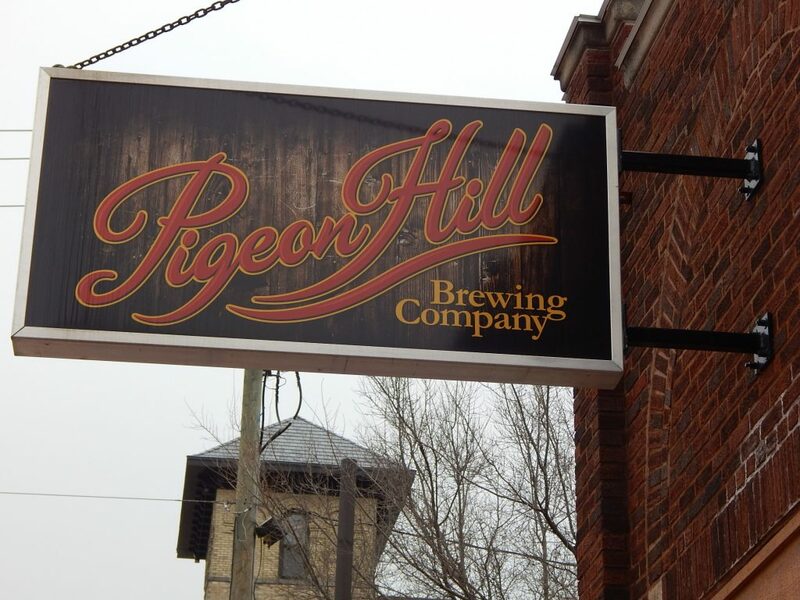 The brewery is slated to sell more than 3,000 barrels of beer this year, and Pigeon Hill beer is sold in about 1,150 locations throughout the state of Michigan. Too, the brewery is set to move into its $2 million, 15,000-square-foot production brewery at 895 Fourth St. in downtown Muskegon. Brower said they hope to move their offices into the new space in about two weeks and expect to start brewing there on May 2. Once a massive sand dune towering a couple hundred feet above the western shores of Muskegon Lake, Pigeon Hill was an iconic attraction that drew tourists from across the country in the late 1800s and early 1900s. Named for the thousands of passenger pigeons that would congregate around the dune’s peak, Pigeon Hill was a major point of pride for the Muskegon community. However, that sand dune was sold in the early 1920s, and mining operations began there in 1926. By 1938, the dune had been reduced to a series of sandy bumps. 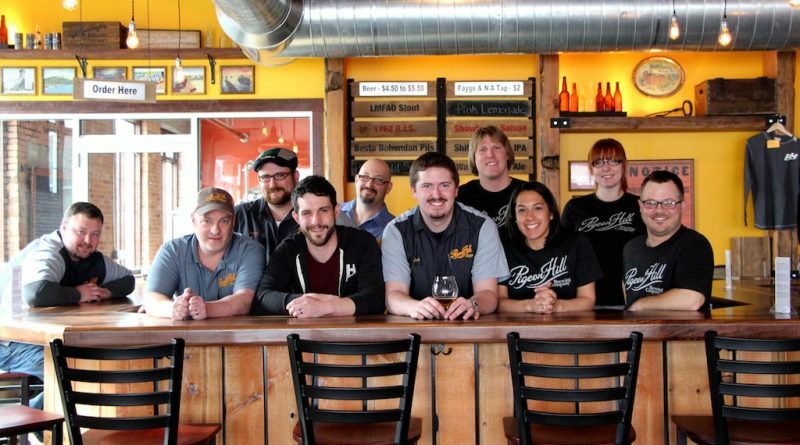 Now, close to a century after the mining of the dune began, there is a thriving Pigeon Hill in Muskegon again—and the brewery has, since its inception, focused on celebrating its city’s past, present and future. Boasting a bar constructed with black walnut that was harvested and milled in Muskegon, the brewery also has table tops made from white pine that was cut down in the 1880s, sent to a saw mill that has since become the Great Lakes Marina, and ultimately dredged up using federal grant money. Inside the taproom, there’s a 55-foot mural of a historic Western Avenue and bottles from the Muskegon Brewing Company, the city’s original brewery that opened in 1876 and was long regarded as the best brewing company in the Midwest. And so, as bar goers drink their Shifting Sands IPAs and Oatmeal Cream Pies, they’re doing so in a space that tells the story of their city: of industry, of the depletion—and restoration—of natural resources, of the people who have ridden the ups and downs of economies that have soared and plummeted. Now, as the area’s development seems to be on warp speed, Brower said he hopes the region will continue to support numerous different industries to achieve a diverse economy. “I hope we don’t rely on any one industry, that we don’t rely on only tourism or revert to only manufacturing—but embrace all of it and embrace bringing new people into the community while, at the same time, not losing sight of what we are,” he said. Now that Pigeon Hill has a half-decade under its belt, where does it go in the next five years? Some of those accomplishments include diversifying their product, including continuing to be adventurous with their brews, such as growing their sour beer offerings, and distilling and packaging spirits. Pigeon Hill is already shipping its rum and a ready-to-drink cocktail will be coming from the brewery in a matter of weeks. And, once the brewery moves into its new production space, it will be figuring out what to do with the building where they now brew at 441 W. Western Ave. in downtown Muskegon. 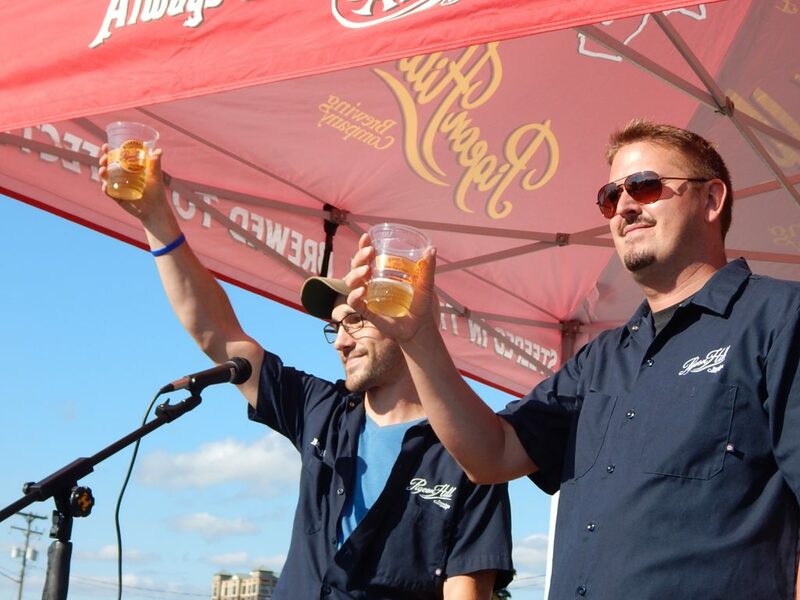 This Friday, March 22 and Saturday, March 23, Pigeon Hill will host its fifth anniversary party, and the event will include a heated tent, live music, new beer releases, and more. For the two-day soiree, the portion of Western Avenue outside Pigeon Hill is shut down to traffic and a large, heated tent is put up. Cover for the event is $5 both Friday and Saturday nights. You must be 21 or older to attend. The event, Brower emphasized, is a chance for Pigeon Hill to share its gratitude with Muskegon. 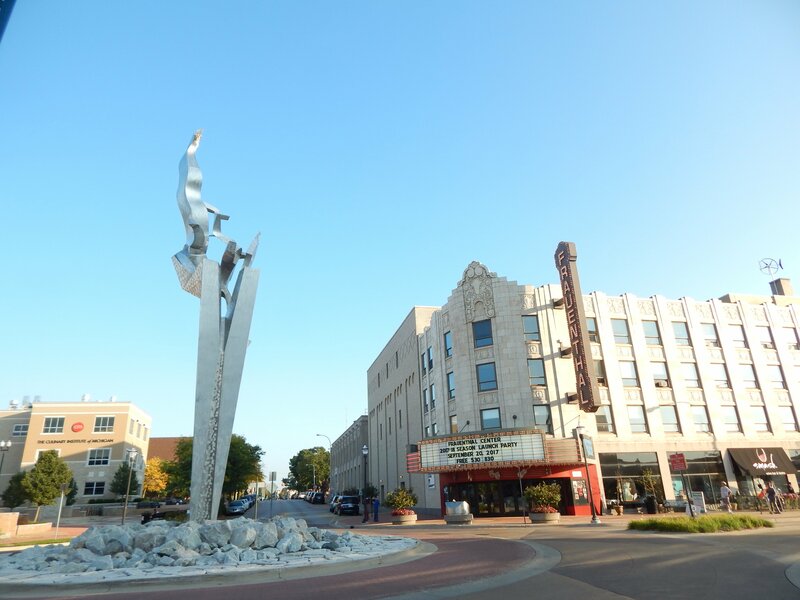 I am so excited by the growth in Muskegon. In the 60’s I was a young teen-ager living in Spring Lake. My mom would take me shopping and out to lunch in downtown Muskegon and I would go with my dad to hockey games at Walker Arena. Now, in the last quarter of my life I am thrilled to have a condo on Muskegon Lake. I am looking forward to summer and learning more about all the changes. Kudos to all who have had a part in planning for the future. As a 26 year veteran of the beer business and a native Muskegonite, please accept my heartfelt congratulations on all you have accomplished! Great people always so nice!